I am an independent, full-time jewelry appraiser in Nashville. While you watch, I will prepare a professional and thorough appraisal document of your jewelry that will be accepted by your insurance company. Your portfolio includes a digital photograph of your jewelry and a detailed, gemologically-correct description that will leave no “wiggle-room” if the item ever needs to be replaced. In most cases, your appraisal documents are ready for you when you leave my office. 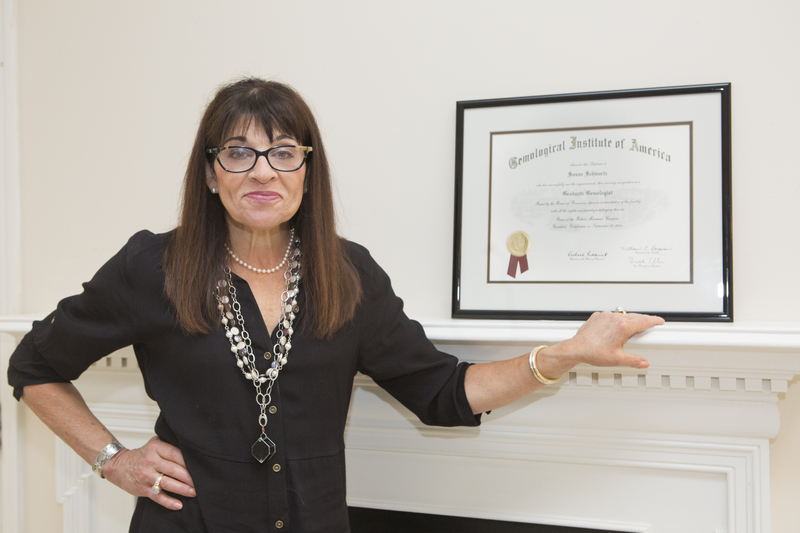 Susan Schwartz, G.G. (GIA) will appraise your jewelry while you wait and watch. 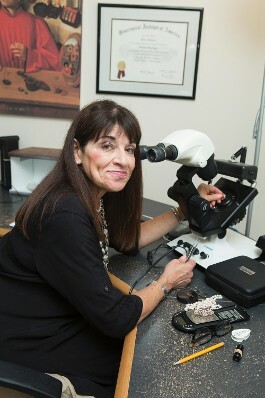 Your jewelry does not have to leave your sight as Susan examines your jewelry and prepares your documents. In most cases, your appraisals are ready immediately: a digital copy ready now to forward to your insurance company and a hard copy in portfolio for for your archives. I am independent. I don't buy or sell jewelry, diamonds or gems; I don't buy and sell gold. On several occasions I have brokered jewelry for clients. Those occasions have been rare. My position allows me to act with no conflict of interest. I will give you a thorough, current and unbiased appraisal for you to provide your insurance company, including a digital copy to send immediately. 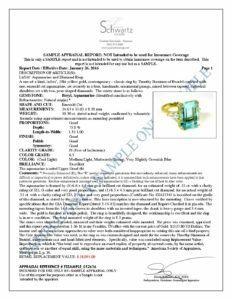 I am more than a gemologist or a jeweler who does appraisals on the side; I am a professional appraiser, actively studying appraisal methodology. I appraise diamonds, colored gemstones, pearls, antique jewelry, as well as some watches. I do estate appraisals, perform gem identifications, fine jewelry and gem collection photography, confirmations of purchase, and can advise you on purchasing and selling jewelry. I have testified in court as an Expert Witness. Inherited collections of is it even real? jewels are quickly sorted and categorized: fine jewelry, costume jewelry, and so on. 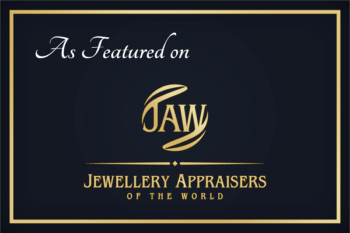 I am a Graduate Gemologist (GIA) – Appraiser. I adhere to Gemological Institute of America grading standards. I am an American Society of Appraisers Candidate and am actively pursuing education through the ASA. Appraisal fees generally run $ 100 – $125 to start, but are based on item liability, complexity and purpose of the appraisal, as these determine the time required to do a thorough job. I will examine the piece and quote the fee before performing the work. You may not even need a full appraisal; a simple consultation, verification of purchase or other service will be recommended if more appropriate. I won’t take shortcuts on insurance appraisals. My task is to protect you by making it clear to your insurance company: this is what you own, and this is what will be replaced.. “…Failure to state all elements of value in an item’s description is to fall short of due diligence.” says William Hofer, FGA,. I agree. I am a truly, INDEPENDENT jewelry appraiser in Nashville, Tennessee. I adhere to Gemological Institute of America grading standards. I do not buy or sell jewelry, diamonds, gems or gold. "Thank you Susan. Its so refreshing to find someone who is truly an expert at their work and so knowledgeable. You were just what we were looking for." - Sincerely, B. A. M.